WASHINGTON — The Tea Party political movement saw a major split over the weekend, with the National Tea Party Federation expelling a member group after its spokesman wrote an online post satirizing a fictional letter from what he called "Colored People" to President Abraham Lincoln. On its website, the federation stated it had given the Tea Party Express, through direct contact with one of its leaders, a deadline to rebuke and remove spokesman Mark Williams. "That leader's response was clear: they have no intention of taking the action we required for their group to continue as a member of the National Tea Party Federation," the federation stated. Therefore, effective immediately the National Tea Party Federation is expelling Tea Party Express from the ranks of our membership." Federation spokesman David Webb, interviewed Sunday on CBS' "Face the Nation," called the blog post "clearly offensive." Williams, who said his letter was satirical, started it like this: "Dear Mr. Lincoln, We Coloreds have taken a vote and decided that we don't cotton to that whole emancipation thing. Freedom means having to work for real, think for ourselves, and take consequences along with the rewards. That is just far too much to ask of us Colored People and we demand that it stop!" A conservative talk radio host, Williams later removed the post as criticism grew. Williams' post was a reply to a resolution by the National Association for the Advancement of Colored People (NAACP) earlier this month that called on Tea Party leaders to "repudiate the racist element and activities" within the political movement. Immediately after the resolution, Williams said it was unfortunate that the NAACP had chosen to "profiteer off race-baiting and fear mongering" when it could be doing so much to help the black community. He also questioned the motives of African-American leaders, suggesting they were taking advantage of the publicity the resolution generated. "I'm not surprised they are jumping into the fray here because the NAACP just tapped a Gulf oil well full of cash contributions that will arrive from this resolution," Williams said. "And I know Al (Sharpton) and Jesse (Jackson, Jr.) want their piece of it. The slave traders of the 16th century should have been as good at exploiting Africans as these people are, because it's just disgusting." 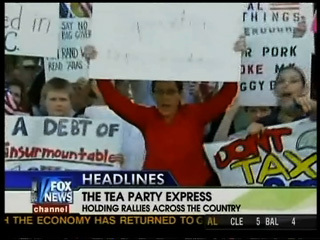 On its website, the Tea Party Express does not say how many supporters it has, but on Facebook it has 600 followers. The federation says 61 groups are members, and that it has "affiliate relationships" with 21 other groups. I saw this, but was too disgusted to comment on it. Now let's watch Sarah Palin spin this thing. Don't you mean, no t-baggers want to refudiate this comment? Williams and Tea Party Express coordinator Joe Wierzbicki issued lengthy statements after the expulsion dismissing the move and ridiculing the federation -- an upstart group formed in April with the help of the Tea Party Express. "The Tea Party Express with over 400,000 members is by far larger than the Tea Party Federation's entire membership," Wierzbicki said. "Most rank-and-file Tea Party activists think we're talking about Star Trek when we try to explain who the 'Federation' is. Given the absurdity of the [COLOR=blue! important][COLOR=blue! important]actions [/COLOR][/COLOR] by the 'Federation,' this is quite fitting, since their conduct is alien to our membership." Apparently they don't see what they did wrong. I liken this to the child molesters in the catholic church... not all priests are molesters, very few are. Not all parishoners are molesters, not all have been molested. Most catholics stay catholic even if they don't agree with or follow the church. But when they turn a blind eye to such a disgusting and obvious thing, we really have to wonder about how ignorant they are. Williams and Tea Party Express coordinator Joe Wierzbicki issued lengthy statements after the expulsion dismissing the move and ridiculing the federation -- an upstart group formed in April with the help of the Tea Party Express. <---- I have to wonder if this comment is by faux or by the tea party express, either way it looks like spin to me. 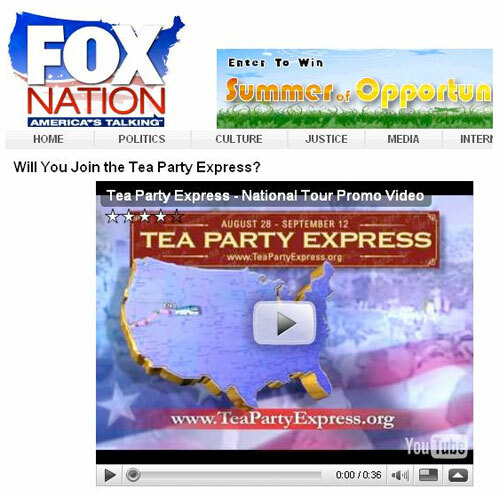 On August 28, Fox News devoted live coverage and publicity to the kickoff of the Tea Party Express, a bus tour organized by the Republican PAC Our Country Deserves Better, whose mission is to oppose President Obama and the Democrats. Fox News' kickoff coverage follows numerous promotions of the tour on Fox News, Fox Business, The Fox Nation, and FoxNews.com. about as fair and balanced as MSNBC is !!!! Difference is that MSNBC does not claim to be FAIR and BALANCED!!! whatever makes you sleep good at night !!! Shall I list all the Racists in the Democrat Party?? I could go on for a very long time and take up a shitload of Dave's hard drive space...but I won't out of respect for my keyboard. a reply to a resolution by the National Association for the Advancement of Colored People (NAACP) earlier this month that called on Tea Party leaders to "repudiate the racist element and activities" within the political movement. Back in the '60s or now? But this seems to be OK with the Left..
Last I check the left has taken a live and let live stand. Unless you are speaking of someone else in the NCAAP besides Sherrod, whose clip was taken out of context by a tea-party conservative blogger, I have yet to hear the NCAAP promoting the killing of white people. HOIW DARE YOU REVEAL LILY FOR THE DUPE THAT HE/SHE IS!